Mount St. Helens is an active volcano comes under the category of the stratovolcano. It is located in the Pacific Northwest Region of United States. Mount St. Helens peak is at an elevation of 2550 meters above sea level. The last eruption was seen on 10th July 2008. Though the mountain’s activity is being recorded continuously from 20th March 1980 when even a jolt of an earthquake with Magnitude 4.2 was felt. However, from the past 3 decades, any strong earthquake hasn’t hit that region. Sometimes it is common to experience a series of mild earthquakes within the time of a few hours. With the advancement in technology, scientists, geologists, and geophysicists have successfully built a 3-D structure of this volcano. This helps them to predict the probability of future events that might take place on this mountain. It is one of the most famous volcanoes in the world. The Global Positioning System (GPS), a type of instrument that detects the settling behaviour of the Mount St. Helens can detect the movement of the volcano by 1/16 of an inch. After the eruption of one of the most famous volcanoes, the landscape around the area devastated into the rich and diverse habitat for flora and Fauna. 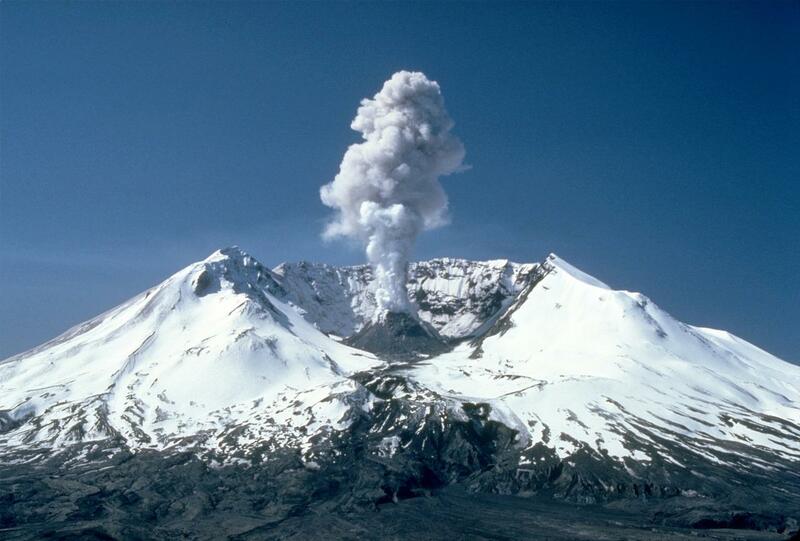 On the morning of May 18, 1980, the largest terrstrial landslode happened in the hstory and in approximately 15 minutes, a vertical plume of volcanic ash rose over 80,000 feet. Krakatoa is a volcanic island located in Sundara Strait, an extension region of Indonesia. Krakatoa recorded its most explosive eruption in the year 1883 which is amongst the most dreadful explosions in the world. Krakatoa lies on the Indian-Australian and Eurasian tectonic plates which are considered to be a zone of high volcanic and seismic activity. In 1883 the volatile volcanic discharge from Krakatoa contained nearly 21 cubic km of rock fragments and ashes which engulfed an area of about 3000 square miles. After this terrible eruption, the surrounding region of the atmosphere was covered with darkness and ashes for almost 60 hours. The fine air circulated around the whole atmosphere making the spectacular orange and red sunset throughout the year. Due to the vast amount of lava and other volcanic materials that erupted out from this mountain the shape of Krakatoa has become Caldera. Talking about the history, the eruptions of 1927 have built a new island at the same location known as Anak Krakatau. However, later periodic eruptions have continued and the latest eruptions of 2009, 2010, 2011, and 2012 and major one happened in 2012. In 2017, the height of the island is now 400 m above the sea level and the height reduced to 110 meters. It is a somma stratovolcano i.e its volcanic Caldera structure is half filled by the new central cone. Actually, it’s upper summit has grown again, so this mountain is also called Mount Somma. The geologists and volcanologists claim that this is the most unpredictable mountain for its eruption. Its upcoming events are hard to predict as it sometimes shows unpredictable volcanic activity. This mountain is situated in Naples, Italy. Vesuvius or Plinian type of volcanic eruption is shown by them. Plinian eruption includes volcanic debris and hot gases which reach up to the second layer of earth’s atmosphere i.e. stratosphere. Its lava is rich in Silicates and its ashes contain pumice stones. Plinian eruptions have a very loud sound just like Krakatoa eruption. It showed the last eruption in March 1944. Talking about the history, the volcano was formed by the collision of two tectonic plates known as the African and the Eurasian. As the natural process happened where water-saturated sediments of the oceanic African plate were pushed to hotter depths inside the planet making the water boiled off and later lowered the melting point of the upper mantle enough to partially melt the rocks. Now, because the magma is less dense the solid rock it pushed upward and later finding the weak spot from where it broke off. The name of this mountain is derived from the Greek word “Aitne” which means “I burn”. This mountain which is situated in Sicily, metropolitan city of Catania, Italy is the only active volcano in the whole of Russia. It is a stratovolcano with its highest peak reaching 3350 meters above sea level. It heights vary like other active volcanoes. It’s height increases from deposition and decreases due to the periodic collapse of the Pacific Rim. Geologists study suggests that Etna’s volcanic activity has been active for past 2.6 million years. According to new research, Radiocarbon dating has shown that Mount Etna has been moving for millions of years and it has been told that this active volcano of Europe is slowly edging towards the sea. The continuous activity of this volcano has a deep impact on the atmosphere and the ecological system. One of the most famous volcanoes is also Sicily’s main tourist attractions where millions of tourists are visiting the place every year. The common route to reach the volcano is through the road leading to Sapienza Refuge ski area, lying at the south of the crater at an elevation of 1910 m and from the Refuge, a cableway runs uphill to an elevation of 2500 m and from their crater area at 2920 m is accessible. This is the best route to reach one of the most famous volcanoes in the world. Watch Now: Mount Etna Sicily Europe’s highest active volcano erupts. One of the most famous volcanoes in the world, Mount Loa is one among five volcanoes that complete the Island of Hawaii in the US. It is considered to be the world’s largest volcano in both mass and volume. Its first historical eruption took place in the year 1843 and from then onwards it has erupted 33 times to date. It is categorized by the active volcanoes. From updated records, this volcano has been the tallest amongst all other volcanoes in the world. Its height is approximately 4169 meters. Measuring its height from its base Mount Loa stands 56000 feet which are nearly 17 kilometres above its base. The city of Hilo which is situated at the nearest distance to this volcano was affected badly by the eruptions of 1935 and 1942. The volcanic activity of this volcano has even caused earthquakes. In the year 1868, an earthquake of magnitude 8.0 came and took the lives of many in the surrounding region. It is also listed as one of the most dangerous Active Volcanoes in the world. According to the recent history, Ancient Hawaiians have been present on Hawaiʻi island for about 1,500 years, howvever, they have preserved no volcanic activity records on the island. It is believed that the possible eruptions have been happened in 1730 and 1750 and sometime during 1780 and 1803. Mount Fuji is the highest mountain in Japan. It is situated 100 km southwest of Tokyo. In Japan, it is commonly called “Fuji-san”. Its highest peak reaches 3376 meters above sea level. It is an active volcano with 1st eruption taking place in 1707. According to Geologists, the Fuji is formed some 2.6 million years ago by an earthquake. Due to its perfect conic shape, it is even worshipped as a sacred mountain. It is an attractive place for tourism and even experienced big popularity among artists. Mostly the atmosphere around mount Fuji is cloudy with little fog. Visibility of this mountain tends to be better in the colder season as compared to summer. Mount Pinatubo is an active stratovolcano. It is located at tripoint boundary of the Philippine province of Zambales, Tarlag, and Pampanga. It’s a volcanic eruption on June 15, 1991, is considered to be the world’s largest volcanic eruption of the past century. In the volcanic eruption of 1991 more than millions of tons of carbon dioxide was ejected into the atmosphere which resulted in ozone depletion and a decrease in overall temperature all around the globe. The ozone depletion over Antarctica increased in its size after the eruptions from Mount Pinatubo. Mount Pinatubo is still active and its volcanic activities are more likely predictable by Geologists with the help of advanced technology. One of the most famous volcanoes in the world, Mt. Pelee which rises up to 1397 meters, lastly erupted in 1932. In the current state, it is a non-active volcano yet its seismic activity are being recorded. Became famous after its eruption in 1902 which took lives of thirty thousand peoples burning the whole city from its lava. It is situated on the Caribbean island of Martinique. Mount Tambora is the largest volcanic eruption ever recorded, situated in Indonesia. It threw too much ash into the atmosphere when exploded in 1815 that it completely wiped out sunlight. About 10000 people die by the lava flow and poisonous fumes. It lost its height from an eruption in 1815 and is now only 2851 meters high. The mountain is active and has shown many seismic activities in recent years. Mount Cotopaxi is an active stratovolcano in Andes mountains situated in South America. It is one of the world’s highest Volcanoes with an elevation of 5897 meters. This Volcano is a part of Volcanoes around Pacific plate and is there termed as Pacific Rim of Fire. This Mountain is considered to be a sacred mountain by Andean people from a long time. Till date, 87 eruptions have been recorded from this mountain, which makes it one of the most active volcanoes of Ecuador. These are the most famous volcanoes in the world. Please do share your comments.